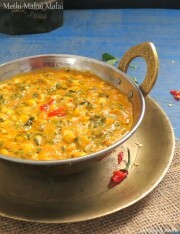 Daal and kadhis are made regularly in Indian kitchens to serve along the staple rice. 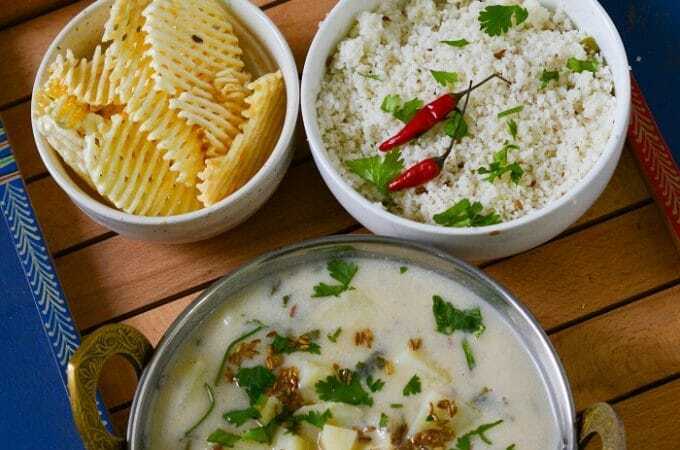 Kadhi is made in every state with little variation depending on regional taste and availability of ingredients, so each region and household have their own favourite kadhi recipe .So we have so many favorite and popular versions of making kadi in Indian cuisine. 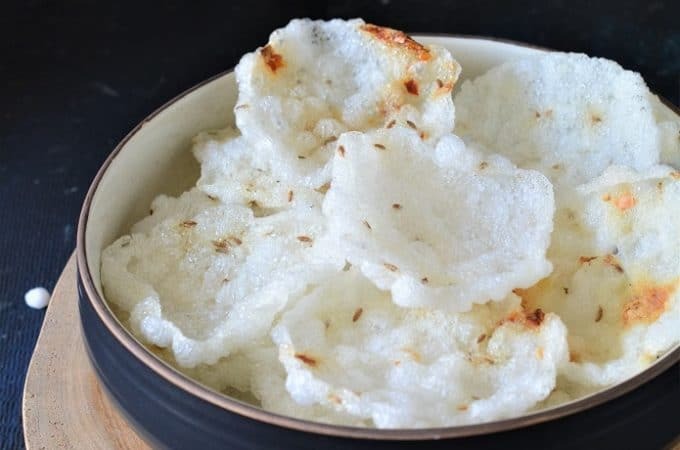 In Northern India kadi is made with lots of sour curd and besan and in Southern Part they use coconut in making kadi. 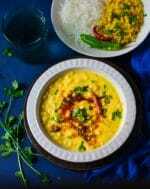 In Uttar Pradesh the popular kadis are Pakoda kadhi , Boondi ki kadhi which is very quick and easy to make as you can add readymade boondi in it. 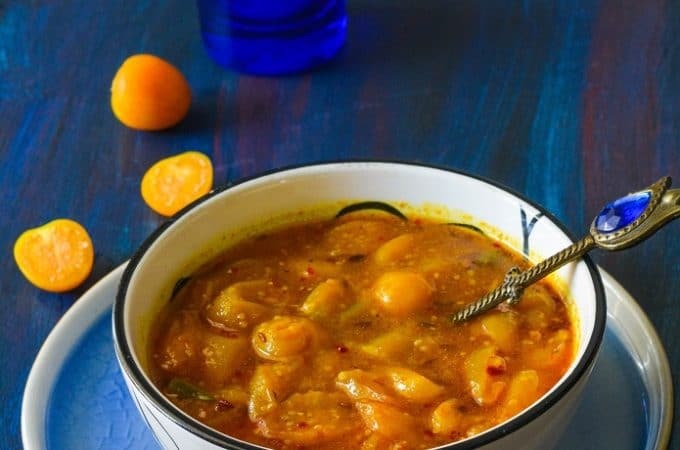 Other Regional special kadi is – Aloo ,matar Mongodi ki kadhi which is specially made in all auspicious occasions and weddings and birthday celebrations in my community and served with very delicious and different – Khatti methi sabut moong . 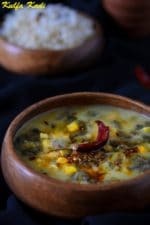 A kadi with healthy and cooling green leaves- kulfa aur Chana daal kadhi is again a regional specialty and I learned that from My Grand mother. 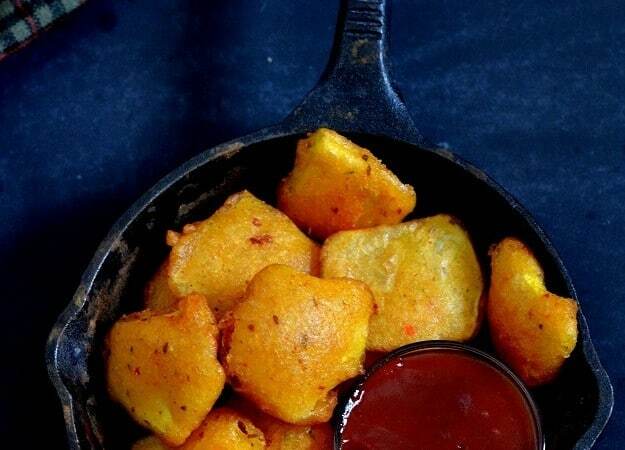 Usually pakoda kadi is made with besan/gram flour but this pakoda kadi is made with Moong daal ki pakodis and is my favourite and made often in my kitchen is – Miloni ki kadhi or katro ka jhor which is very popular in U.P and Rajasthan. 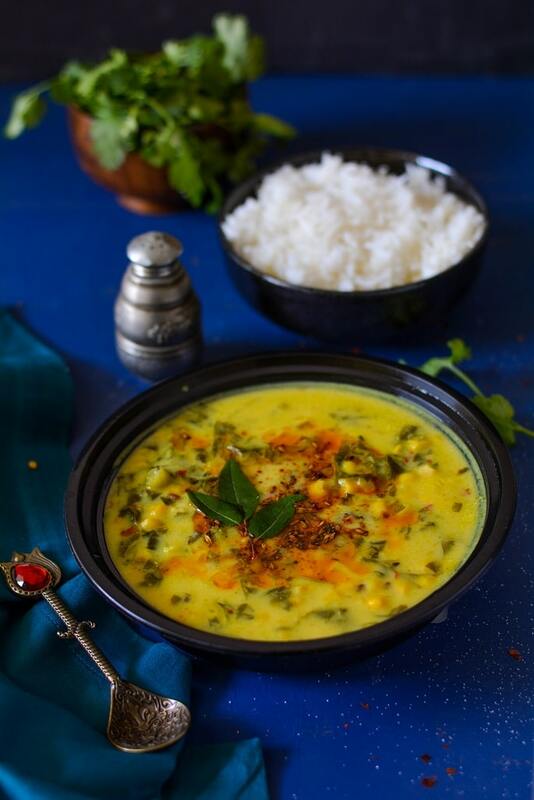 But we keep trying and learning new recipes every day,last week I had this amazing kadhi at my friends place and loved the contrast combination of the sweet taste of corn and slightly bitter fenugreek leaves. 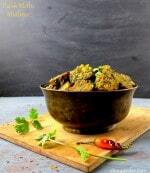 She served this with jeera rice but it goes very well with steamed rice and vegetable pulav. 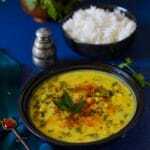 Do try this healthy kadhi this season as fresh fenugreek leaves are availble in abundance every where . You can also follow me here- Facebook, Twitter, Instagram and Pinterest to learn new recipes every week. 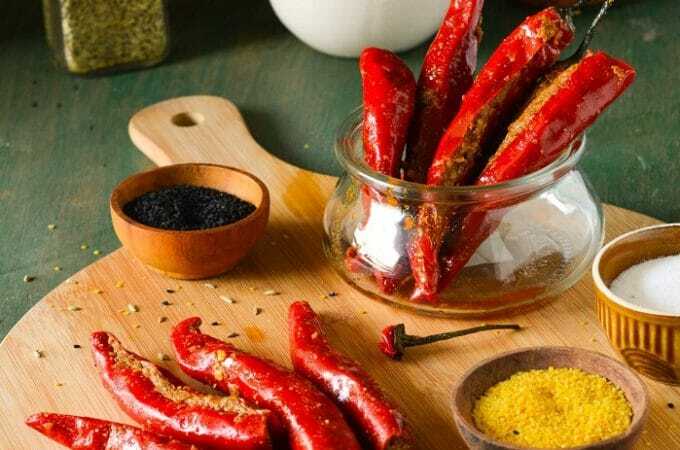 In a big wide pan add cooking oil and when it become hot add fdenugreek seeds and mustard seeds . When the seeds start to crackle add asafoetida and chopped fenugreek and saute for a minute. Now add turmeric and chili powder and stir to mix. 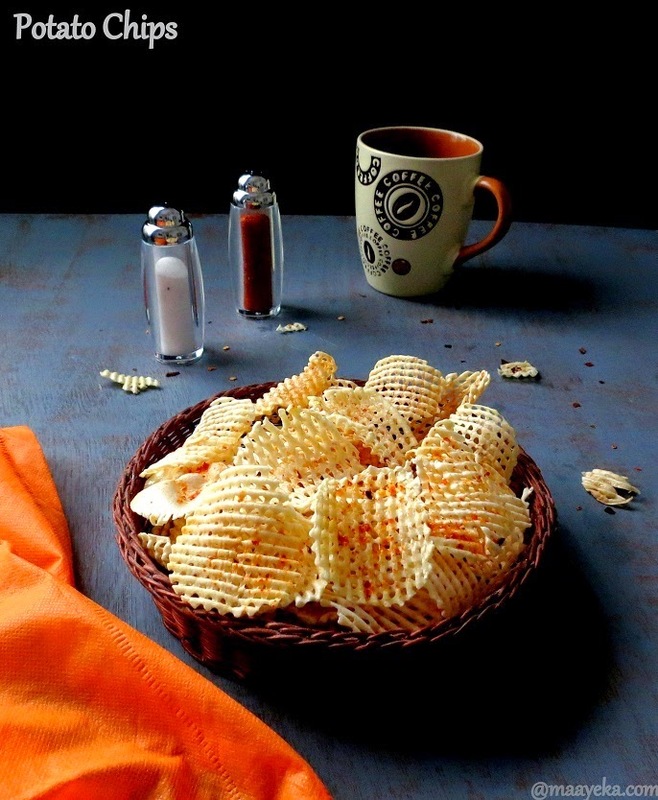 Add the prepared yogurt and gram flour mix and 6 cups of water and stir to mix well. Add salt,and let it cook on medium high heat so it will come to a boil . Now add corn and the chopped spinach,fenugreek leaves,green chili ,ginger ,coriander powder and chili powder in the boiling kadi and mix . When done add lemon juice and remove from it from the flame. 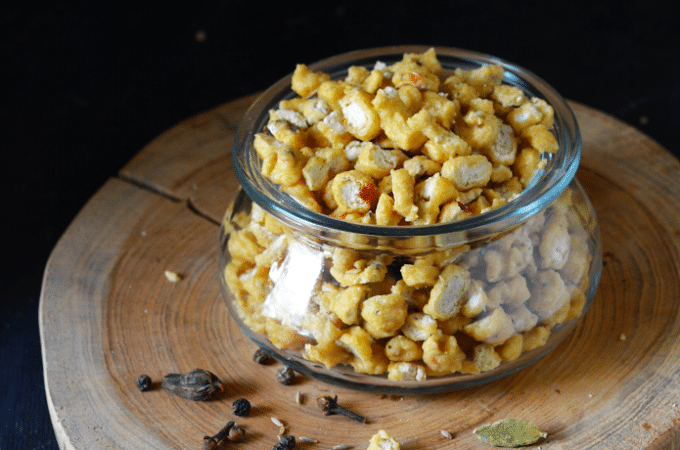 Heat a tbsp of ghee in a small pan and add cumin seeds and whole red chilies in it. 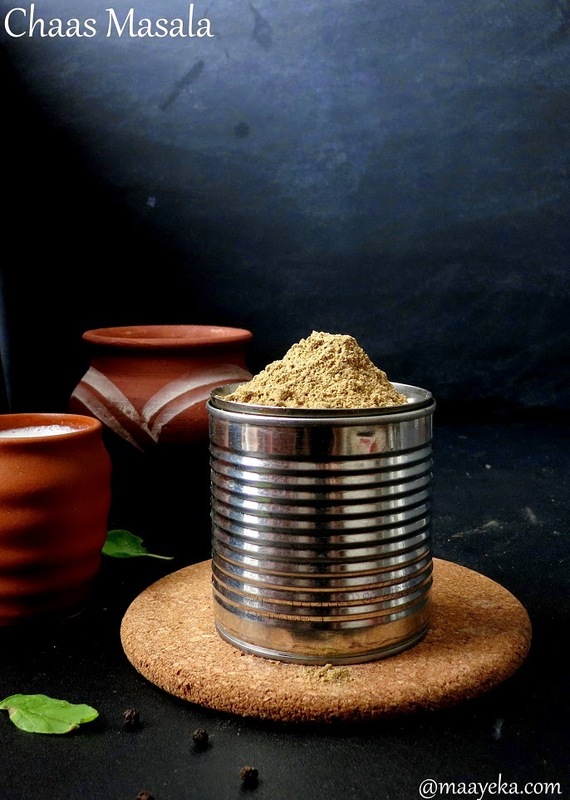 When cumin start to crackle remove from the heat and add red chili powder and pour over the prepared kadi. 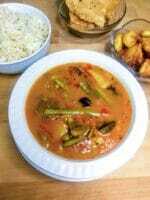 Serve hot with steamed rice and roti. You mention Harimirch and adrak as ingrediants but no where in steps you mention adding it. Please clarify. Owing to some diet restrictions I cannot consume besan for sometime. But the rest of this recipe is great for my diet. Can you suggest how I can cook the dahi without it curdling? Shall I cook the veggies first then add dahi on sim and then keep stirring? 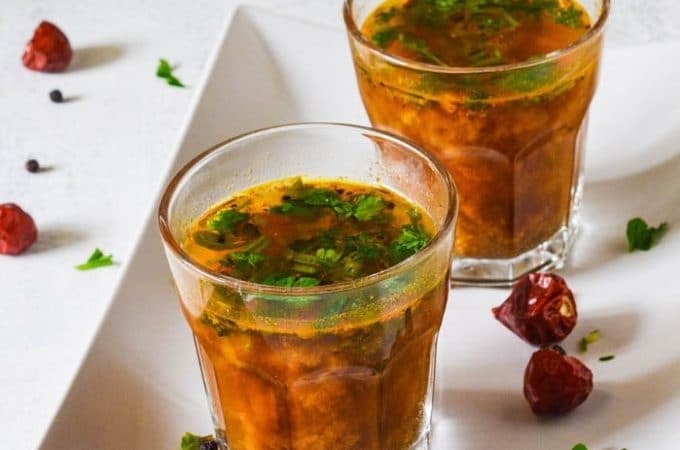 whisk the curd well before adding in the kadi and then add on low heat first and then increase the heat after 2-3 minutes .Keep stirring it at regular intervals.